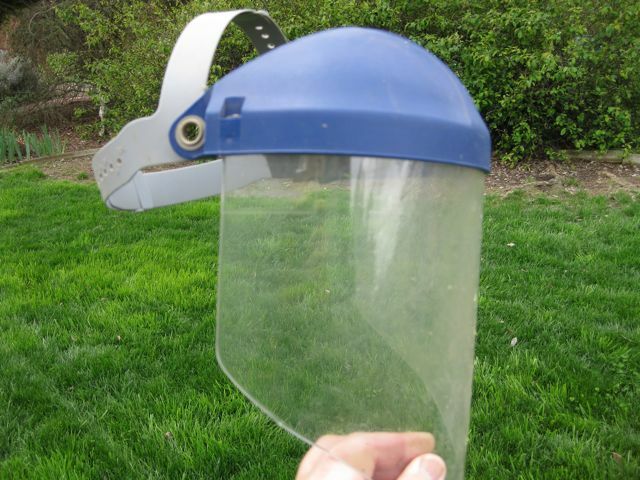 You wear protection when you're whacking weeds, right? 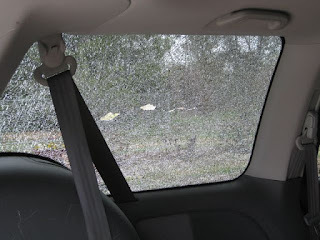 Perhaps a face shield? 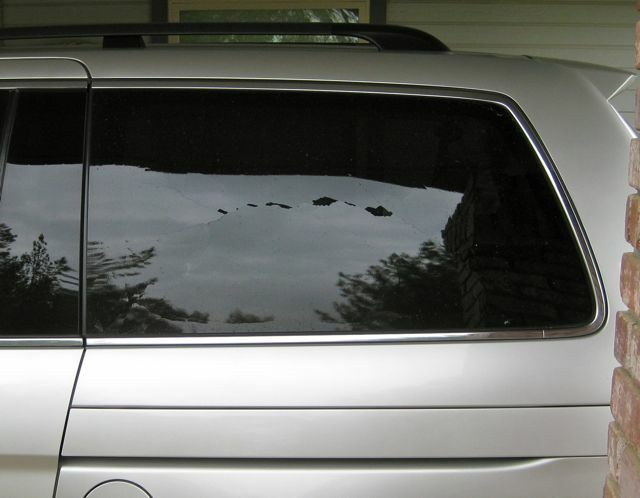 What about your glassy possessions, thirty feet away? Are they protected, especially when that 30-foot zone is filled with weeds combined with bark and gravel? Move the car first. Or, pull the weeds by hand. As spring arrives, so does the annual flood of garden event announcement that garden groups would like publicized on the radio and in newspapers. Computers and the Internet have created a generation of do-it-yourself graphic artists. Although these may be effective as bulletin board posters or nice art for your own website, those of us in the press have a need for information, plain and simple. No fancy formatting, just solid info in the body of your press release e-mail. Yes, you can attach your fancy press release as a .doc or .pdf to the e-mail. But the basic information should be in the body of the e-mail as plain text. This post originally appeared two years ago here; it's time for a refresher course on how you can make our jobs easier, thus increasing the chances of your message getting out to our audiences. When? Who? What? Where? Why? How? How to Write a Public Service Announcement Aimed at those with Attention Deficit Disorder (which includes anyone in Journalism or Broadcasting). This rant is aimed at those of you who are attempting to get publicity for your garden events. You know who you are. You're probably a volunteer for your garden club or organization. God bless you. As a guy who enjoys reading announcements for upcoming gardening events on the radio and likes to cut and paste them on my website, here's some advice: keep it short. By the way, newspapers like short announcements, too. Here are a couple examples from my e-mail box. Got nature? Naturalists of all ages are invited to visit the UC Davis Arboretum for a special chance to explore, observe, investigate, and enjoy hands-on activities. Who knows what plant and animal treasures you'll discover when you drop by! All ages welcome. The Wyatt Deck is located on Old Davis Road next to the redwood grove in the UC Davis Arboretum. Free parking is available in Visitor Lot 5, at Old Davis Road and A Street. For more information, please call (530) 752-4880 or visit arboretum.ucdavis.edu. Spring is bustin’ out all over! – And the (county deleted) Master Gardeners are celebrating this grand event by hosting their annual Spring Plant Sale on Saturday May 8 2010. The sale runs from 9 a.m. until 12 noon at the Master Gardener’s Demonstration Garden located at (address deleted). Cash and checks are accepted for payment. A host of plants of various species and sizes will be offered including shrubs, ornamentals, vegetables, fruits, berries, annuals, and perennials. • educate the public about sustainable organic gardening practices and principles. 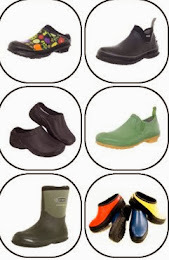 • provide consultative services to the general public regarding plant, insect, and pest identification. • provide guidance for sensible, sound pest management and weed eradication practices. All proceeds of this plant sale - as well as the fall plant sale, support the numerous activities of the Master Gardener program. You’ll want to make this a must attend event on your calendar. We look forward to meeting you and discussing gardening related issues. Local Master Gardeners will be on site to assist you with plant selection as well as to answer any questions you might have. We hope to see you on Saturday May 8. We’ll set aside some plants for you." Excuse me for a minute, while I get the Visine. In the do-it-in-a-hurry world of journalism, the easier you make it for those on the receiving end, the better the chance you'll get positive results. I'm willing to give you 15-30 seconds on the radio (about the length of that first example). Newspapers will limit you to one column inch. Or less. When? Sunday, April 29, 1-3 p.m.
Who and Why? Naturalists of all ages are invited to visit the UC Davis Arboretum for a special chance to explore, observe, investigate, and enjoy hands-on activities. Who knows what plant and animal treasures you'll discover when you drop by! All ages welcome. How? 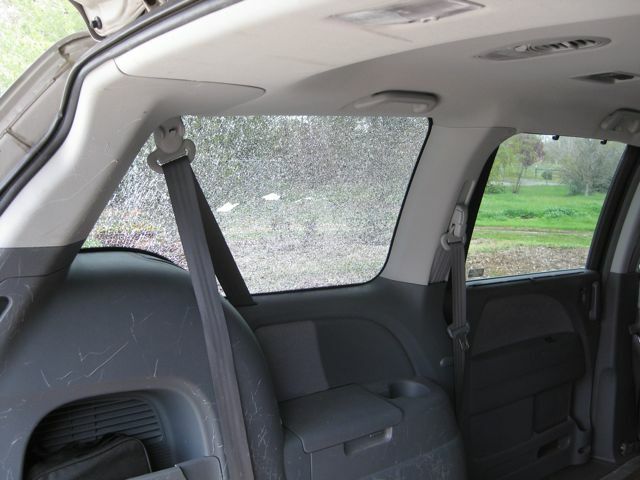 For more information, please call (530) 752-4880 or visit arboretum.ucdavis.edu. There. Simple. Less than one page. Easy for us, good for you. Thanks, in advance. Please pass this information on to anyone you know who is doing the publicity for a garden club or organization. Oh, and if you are a for-profit company: buy an ad. Thanks again. 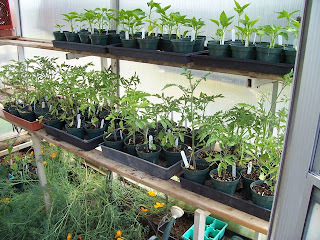 Home gardeners who grow their tomatoes from seed usually get fairly quick results after sowing the seeds indoors. Given the right germinating conditions - a soilless planting mix, good drainage, plenty of light, plenty of warmth - tomato seeds can pop up in 8-10 days. Pepper seeds are a different story. 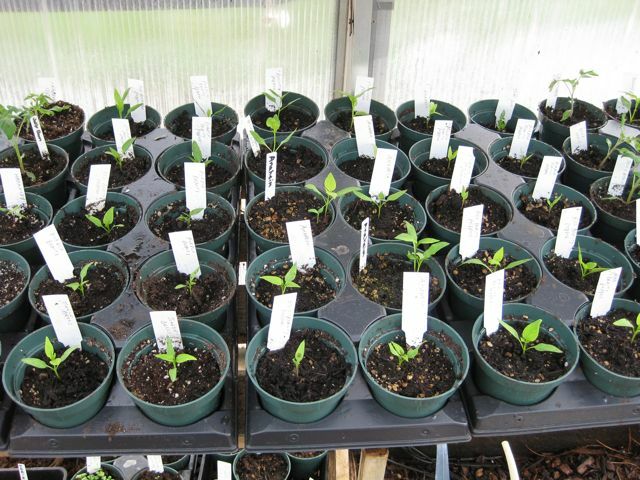 Why is it some peppers can take weeks to germinate? 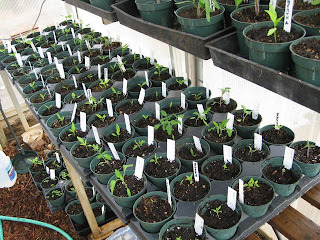 "The important thing in getting your (pepper) seeds to germinate is to keep them warm – the soil temperature should be in the 80's", says Renee Shepherd of Renee's Garden, a popular seed catalog based in Felton, California. "Germination is very much related to even moisture and warm temperatures. You should see germination within 2 to 3 weeks if it's warm enough. 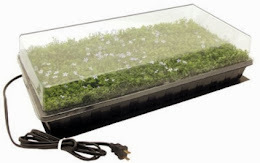 I strongly suggest using bottom heat to achieve the warmth the seeds need – most good nurseries carry good little electric seed starting mats which will keep your seeds at the right temperature to sprout. A local mail order source is Peaceful Valley Farm Supply." 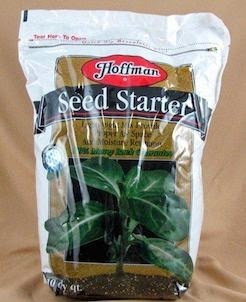 For those who want to comparison shop, another source for heating mats for your pepper seeds: Amazon. Another trick that some gardeners employ is soaking the pepper seed for a few hours before sowing to soften the seed coat. The value of that is open to debate. "I have never heard of soaking pepper seed overnight and have never done it in 20 years of running a trial garden," says Shepherd. 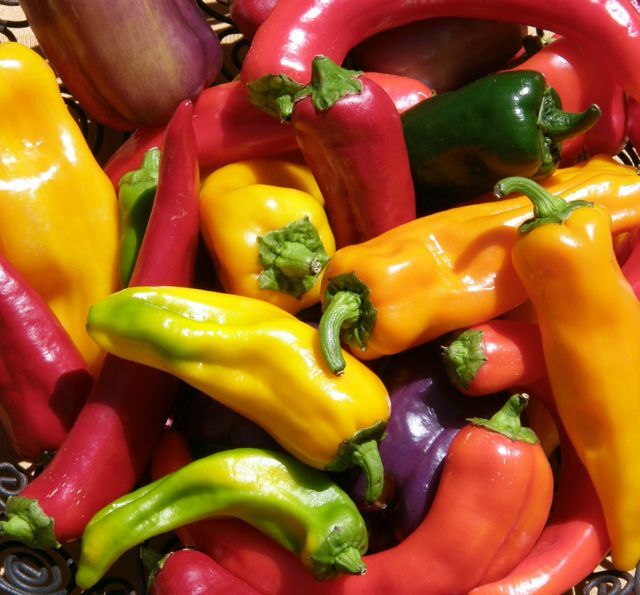 On the other hand, Professor Debbie Flower of the American River College Horticulture Department sees the benefits of some "immersion therapy" for pepper seeds. "We soaked our pepper seeds in hydrogen peroxide for 10 minutes," explains Flower. "That's not enough time to scarify (soften or break the seedcoat), or even get them soaked, but enough to kill exterior diseases." 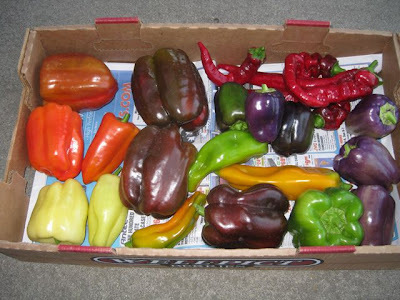 Many sweet pepper varieties will show their initial leaves about two weeks after planting the seeds. 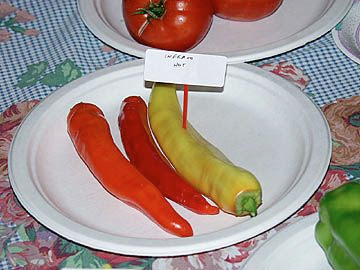 But some varieties of peppers take longer to pop up than others. 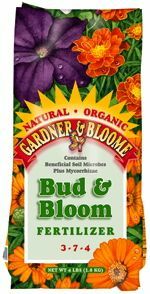 "The hot pepper varieties take longer to germinate, some to three weeks," says Flower. "Chinense species (e.g. Habanero's) generally take longer to germinate than most common peppers. Keep soil warm to very warm (75-90F) for better germination. Do not use acidic soil. Some Chinense peppers, in particular Bhut Jolokia, Naga Morich and related peppers are very slow to germinate, averaging 1-4 months germination time." By the way, if you are growing the Bhut Jolokia...you're playing with fire. The Ghost Pepper is rated at 850,000 Scoville units of heat. For comparison, the habanero rates 200,000; the Jalapeno is 5,000; the Anaheim equals 1,000. And sweet bell peppers? 0. Another factor that can determine the rate of germination of pepper seeds: the pH of your seed starting mix. One of the most common ingredients in most seed starting mixes is peat moss, which is highly acidic, with a pH around 4.0. Pepper heads, including the Horticulture students at American River College, have found quicker germination when Coir (coconut fiber) is substituted for peat moss. Coir has a closer-to-neutral pH: around 6.5. The tests at American River College bear this out after trying Coir in their pepper seed soil mix. "We've had the best germination of peppers ever!" says Flower. And don't be in a rush to set them out in their permanent garden home. "Pepper seedlings need to be grown out until they have at least several sets of true leaves, and it is at least 55° at night before you plant them out," explains Renee Shepherd. "And they will need a little time to get used to being outdoors, as well." Here in the Sacramento area, that would be around mid-May. Be patient. Ever hear of WELO? No? You will, if you plan to install or maintain a landscape in the Golden State. California passed the Water Efficient Landscape Ordinance in 2009, requiring all water suppliers to increase water use efficiency...by limiting the amount of water you use. Landscapers may know WELO by its legislative acronym, AB1881. The ordinance (41 pages long) is still going through the bureaucratic swamp of local governments and water agencies, but implementation will happen, and soon. 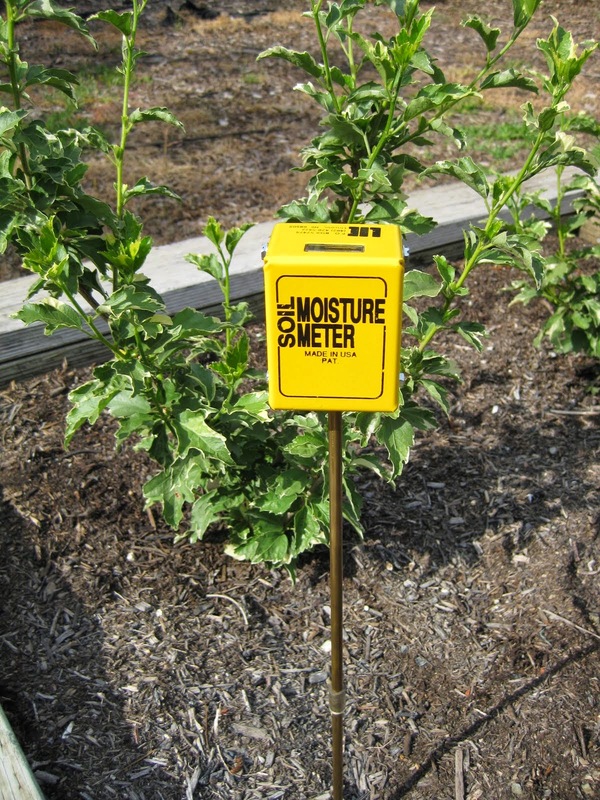 Homeowners and businesses will pay metered rates for actual water use beginning in 2013. The City of Folsom is giving water users a sneak peak now at what their metered water will actually cost them, starting in March 2013. Folsom's intent is to develop a metered water rate that allows for residents who use an average amount of water per month (22.5 ccf or approx. 17,000 gallons) to receive metered rate bills that are comparable to a 2013 equivalent flat rate of $39.55 (if the City had not converted to meter rates). • Public landscapes and private development projects including developer-installed single family and multi-family residential landscapes with at least 2500 sq. ft. of landscape area are subject to the Model Ordinance. • Homeowner-provided landscaping at single family and multi-family homes are subject to the Model Ordinance if the landscape area is at least 5000 sq. ft.
• All new landscapes will be assigned a water budget. 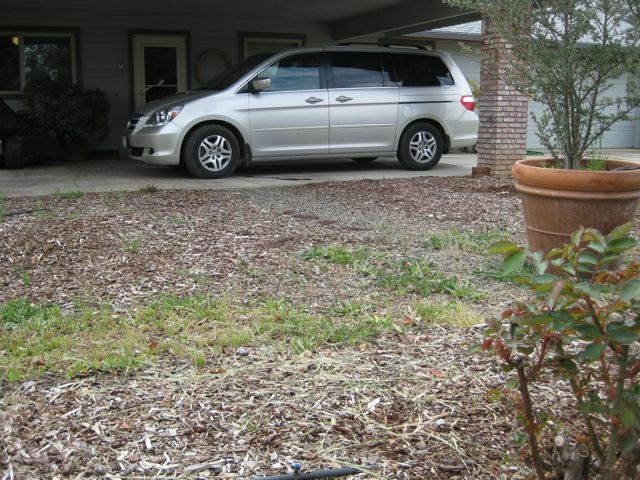 • Landscapes will need an approved design plan, an irrigation design plan, grading design plan and maintenance schedule. Basically, if it uses water, it will need approval, outdoors and indoors. Native and Mediterranean climate plants are already accustomed to much of California’s unique climates. 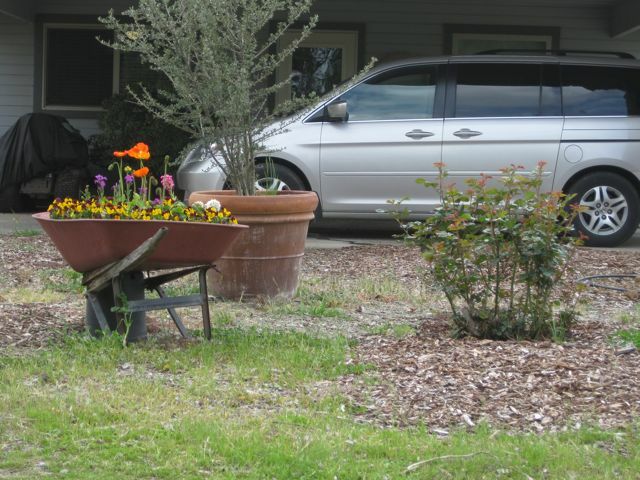 These plants require little water, little fertilizer and very little care. And will become very popular after WELO is fully implemented. 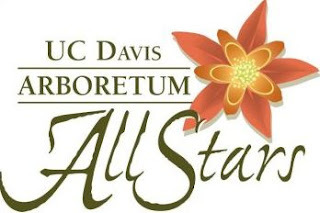 The horticultural staff of the UC Davis Arboretum have identified 100 Arboretum All Star plants. 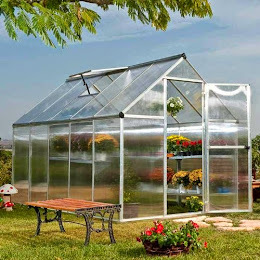 These plants are tough, reliable plants that have been tested in the Arboretum, are easy to grow, don’t need a lot of water, have few problems with pests or diseases, and have outstanding qualities in the garden. Many of them are California native plants and support native birds and beneficial insects. Will that plant thrive in your soil’s pH? Does your soil really need more nitrogen, phosphorus or potassium? 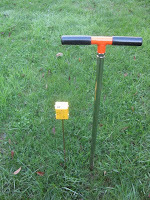 Do a soil test before adding any fertilizer (a soil test is part of WELO approval). "If a little is good, then more is better". That’s definitely not the mentality to use when it comes to pesticides and fertilizers. Always follow the manufacturers instructions when it comes to application methods and amounts. Be particularly careful not to over water your lawn or landscape after applying pesticides and fertilizers. Remember, everything that goes down the storm drain eventually leads to a river. (Yes, prohibiting water runoff - which might contain excess fertilizer or pesticides - is part of the WELO model ordinance). 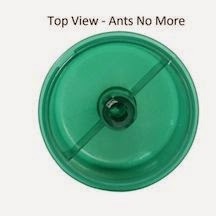 Use cultural, physical or mechanical means to control pests. “Cultural” means: matching the plant with your yard’s conditions: sun, water and soil. Healthy plants can stave off pests and diseases better. “Physical” controls: a row cover, for example, to keep aphids and whiteflies off a young vegetable garden. 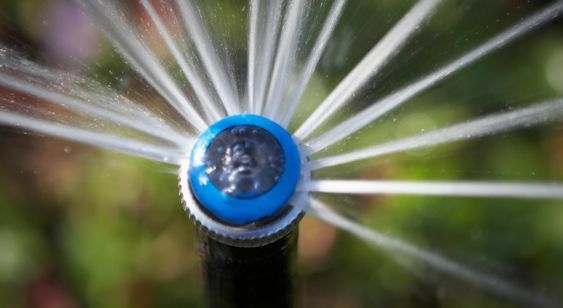 “Mechanical”: a blast of water from a jet nozzle on a garden hose can dislodge aphids from rose bushes, for example ("Just make sure that nozzle has an on-off valve," admonishes Officer WELO). Keep your kids and pets safe by using non-toxic and less-toxic pesticides in the home landscape and garden. 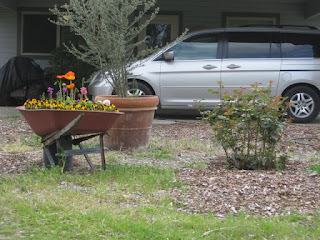 Put in plants that attract beneficial insects. These days, there are a lot of effective non-toxic and less-toxic pesticides for sale at your local nursery or home improvement center. Know the signal words on pesticide products: Caution (least toxic)-Warning-Danger (most toxic). Synthetic chemical fertilizers give plants a jolt of instant nutrition but there are downsides to that, including weaker growth that is more attractive to pests. Synthetic chemical fertilizers can burn plants if not used properly, may build up salts in the soil over time and can also produce new vegetative growth quickly that the plants root system may not be able to adequately support. Stop throwing away kitchen scraps and improve your soil by starting a compost pile or worm bin. WELO says: "A minimum two inch (2″) layer of mulch shall be applied on all exposed soil surfaces of planting areas except in turf areas, creeping or rooting ground covers, or direct seeding applications where mulch is contraindicated." Mulch conserves water by keeping the soil evenly moist; reduces herbicide use because weeds have a harder time popping up through the mulch; reduces fertilizer use; feeds the soil by adding organic matter that feeds the beneficial soil organisms. 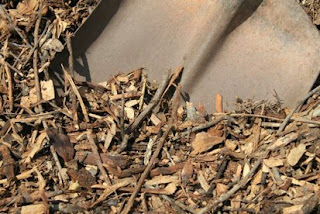 Mulch improves the soil by preventing soil compaction while increasing the tilth (soil structure). Check your irrigation system every month or so to make sure that you are indeed watering your landscape and not the sidewalk or your neighbor’s car. Take care of any irrigation issues such as broken spray heads promptly. 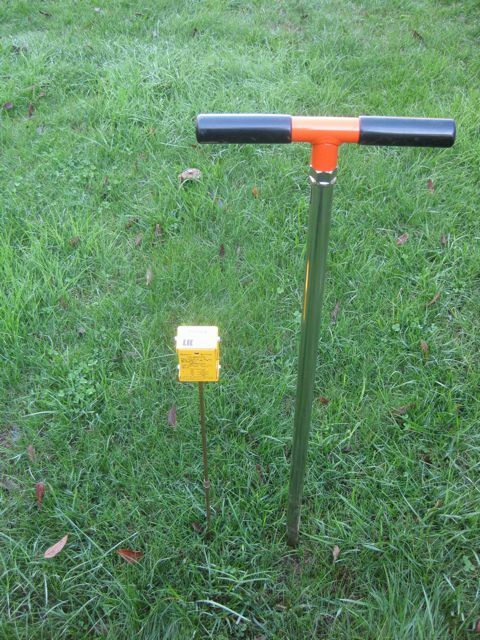 Use a moisture meter or soil probe to help you determine when and how much to water your landscape. 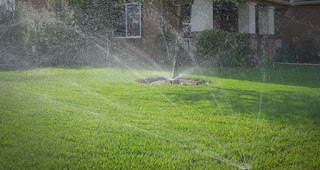 WELO's approved watering hours are 8 p.m.-10 a.m.). 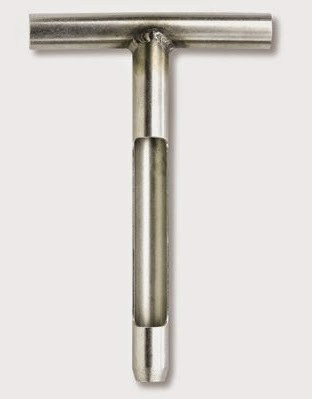 Replace old spray and impulse sprinklers with new models that use 30% less water. And maybe swap out sprinkler systems that are watering small areas. WELO says: "Narrow or irregularly shaped areas, including turf, less than eight (8) feet in width in any direction shall be irrigated with subsurface irrigation or a low volume irrigation system." 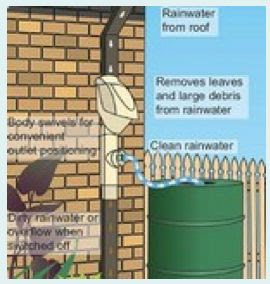 Every home should have at least one rain barrel or rain harvesting system, if not three or four. If 100,000 homes were to have just one 55 gallon rain barrel, it would save 5.5 million gallons of water every year. WELO says: "Rain gardens, cisterns, and other landscape features and practices that increase rainwater capture and create opportunities for infiltration and/or onsite storage are recommended." Ditch the bag and grasscycle with a mulching mower. 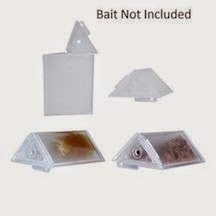 It’s easy, keeps your lawn looking great and best of all - no more heavy bags of grass clippings to dispose of. Mulching mowers, however, are not mandated by WELO. Yet. Reduce the size of your lawn. WELO will nudge you in that direction: "Turf is not allowed on slopes greater than 25% where the toe of the slope is adjacent to an impermeable hardscape." Then, choose turf species that use less water. Blends that include certain fescues or bentgrass require 50% less water. 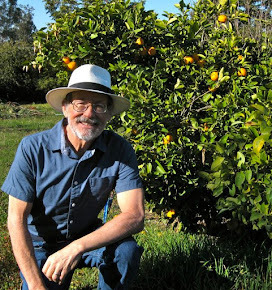 is a program that is under the University of California Cooperative Extension that is designed to assist residents with landscape and gardening issues. The Master Gardener’s IPM or Integrated Pest Management program features tons of information how to deal with pests, diseases and fungus effectively. "Can we make our local ordinance more stringent?" "Yes, due to water supply conditions, climate and other factors, a local agency may make any provisions in its local ordinance more stringent than the Model Ordinance (option #2). For example, a local ordinance may further reduce the ET Adjustment Factor, limit turf grass area, use plant lists, or have specific fire prevention requirements. These will be determined by the local agency."